It doesn't matter where you are with your brand right now… we have something to help you! Strengthen or reinforce your brand. Understand the consumer emotions and values that drive brand loyalty in your category. Determine the specific actions you can take that will have the biggest positive impact on your brand. Figure out how to create excitement about your brand. Develop a fan base for your brand. Obtain a greater share of consumers' wallet. Why are some customers so fanatical about these brands? is an intense relationship or connection between customers and a brand that results in something that goes beyond true brand loyalty. It is the key to increasing brand awareness, sales, and profits because your true fans are your best ambassadors. pinpoints the brand identity elements, both rational and irrational, that impact each dimension in the path to fandom. It provides a clear road map for influencing customers at each stage to guide them down the path to fandom. 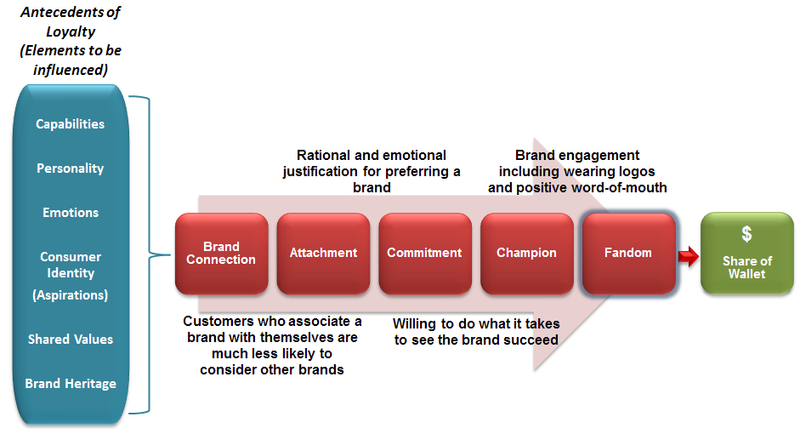 What can you expect from a BrandFan Study? data is collected using an online survey questionnaire that is comprised of several unique batteries of items measured on various scales. It is a cost-effective way to learn how you can influence your consumers and help them down the path to fandom.